I have never seen another rug like this-it combines two printed patterns as the foundation to hook as if one single large rug. There is no seam at the center (perhaps the printed burlap came in lengths meant to be cut into individual rugs, but was not). 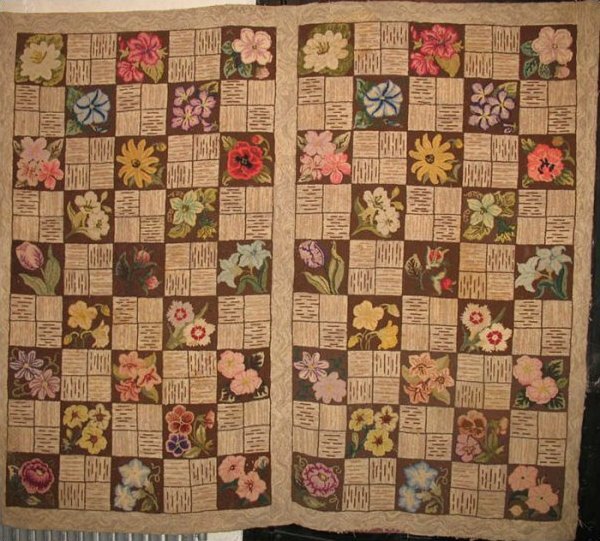 The format is a 'best of kind; example of a classic from the rug revival era of the 30s-40s-50s, in which a geometric block alternates with a floral. In this case the variety of flowers is impressive, realistic, and expertly shades. Even the border and ground is made special with a tweedy hooking materials rather than flat color. If the purchaser wants them made into two separate rugs, that can be accomplished with the rug borders slightly reduced in iwdth all around.